Guest post!!! Mandy was nice enough to do a little guest post for me. Hope you enjoy it. A big thank you to Perry for having me as a guest blogger today! 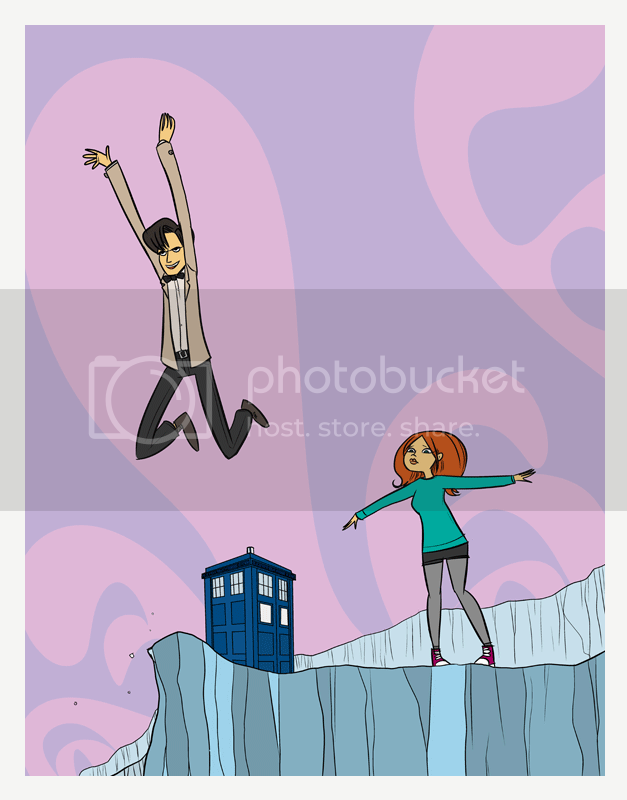 My name is Mandy, and I blog about a wide variety of things—many of them of the nerdy variety—on my personal blog, Chocolate and Cream Cake. I blame credit P with helping me to revitalize my love of nail polish, which I haven’t been into in such a big way since I was in high school. Recently, I was waiting on a microwave meal in the kitchen where I work and I found myself perusing an Avon catalog to kill the three minutes. I haven’t bought anything from Avon in ages—perhaps ever?—but I was immediately drawn to their new Matte polishes. I love the matte look, even though matte manis only last brief amounts of time on my nails due to the amount of typing I do on a daily basis. I couldn’t resist—my lust was exacerbated by the fact that they were on sale—I ordered all four: Violetta, Red Velvet, Black as Night and Grey Cement. I’ve only tried one so far, but—to put it simply—it’s one of the most gorgeous colors I’ve ever had on or near my fingertips. The polish in the bottle shows a shimmer, which I wasn’t sure would translate well in matte form. I was wrong. The shimmer turns Violetta into something lit from within. 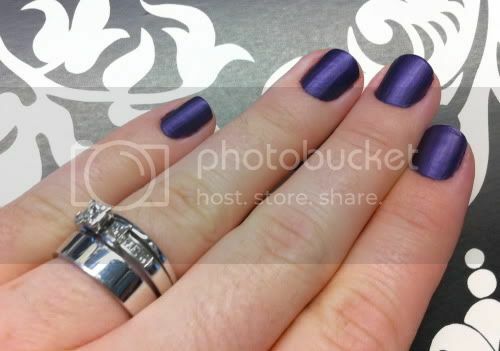 The polish isn’t totally matte, but the finish is definitely on the matte edge of satin. And I bet it would still be gorgeous with a shiny top coat, too. Perry here, Mandy let me choose between a closeup of just her nails or a pic that includes her bling. I obviously picked the pic with the bling. Mandy just got married last month, isn't it gorgeous? Totally send her some congrats if you have a moment. Both photos show two coats, no base or top coat. Had I been more careful, I probably could have gotten away with one. The coverage is great. The wear time was pretty typical for a matte, at least for me. I had tip wear and a few chips by the end of the day. Next time I sport this—and I doubt that’ll be too long from now—I think I’ll try a basecoat to extend the wear, even though you’re not “supposed” to use one. Thanks again to P for letting me post, and to you for reading! The color is gorgeous! I LOVE it!!! 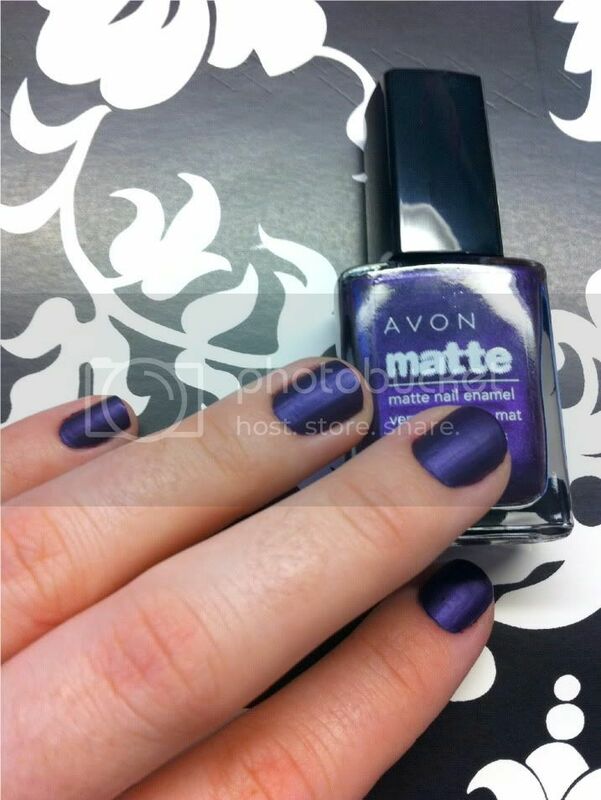 that color is gorgeous, I've never seen Avon do matte before. this is so pretty. I guess I am going to have to get it. I wasn't sure if I wanted it....avon also has a christmas 2010 blue shimmer that is just getting release..I don't know if I want it or not..argh!!! I can't wait to see the other polishes b4 I order the matte blue. I know theres the redish purple. Hermetic-I was pleasantly surprised. I picked up two of their normal colors too, but have yet to try them. SWN-I haven't seen the Christmas colors, but I'll have to check them out!